Newburgh suicide mother told kids "We're going to die together"
(CBS/WCBS) NEWBURGH, N.Y - Police believe Lashandra Armstrong of Orange County, N.Y. killed herself and three of her children by driving her minivan into the Hudson River Tuesday night - one child managed to escape. Lashaun Armstrong, 10, swam back to the shore, where passerby Maeve Ryan found him soaking wet and took him to firefighters, authorities said. Ryan told CBS station WCBS she "will never forget [Lashaun's] face because the fear in that little boy's eyes was just terrible." The lone survivor of the tragedy told Ryan that before they went into the water, his mother went into the back seat and held the kids and said, "If we're going to die, we're going to die together." Fire officials said the boy probably had less than two minutes to escape the 45-degree water after rolling down the van's window. Officials suspect he may have been suffering from some hypothermia when he was at the firehouse. "When Lashaun came to the fire department, he was having difficulty speaking, of course, and was just repeating about the car being in the water with him mom and siblings," said Chief Michael Vatter of the Newburgh Fire Department to the station. Police announced Wednesday the apparent murder-suicide took place after Armstrong was involved in a domestic dispute. Armstrong had apparently found out that her husband had been cheating on her and was distraught, reports the station. 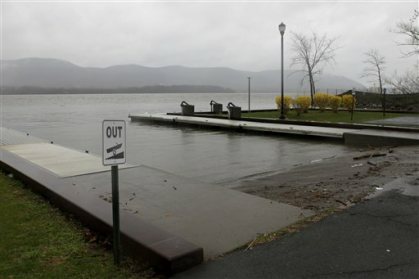 April 13, 2011 - Newburgh mayor calls Hudson River deaths "a tragedy"